Stanley Allan Sherman is a New York City based Leather Commedia Mask Maker who also specializes in Wrestling Masks; www.maskarts.com, and teaches Commedia Dell'Arte in true Commedia fashion through his Roving Classical Commedia University* (*Totally Unaccredited) www.commediau.com. Bruce Marrs (the guy who played Godzilla in the Hollywood movie) makes excellent neoprene commedia masks and teaches maskmaking at Dell'Arte International in Blue Lake CA USA (check out their summer workshops): www.marzillamask.com. Bruce was my mime teacher (he studied at Ecole Marceau and Ecole Decroux in France). Todd Espeland and Bruce Marrs (addresses above). 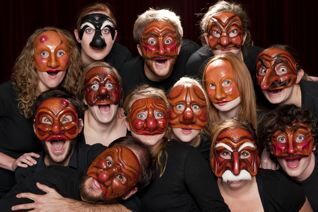 In Sweden: Torbjorn Alstrom makes exquisite commedia and performance masks from leather and wood: www.artmask.com. 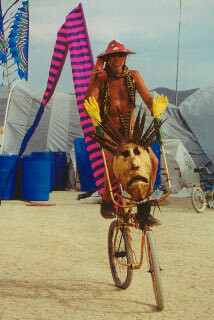 In the Netherlands: Joe Dieffenbacher makes great neoprene and Papier mache masks and also performs: www.nakupelle.com. In Australia: www.makeascene.com.au for training programs and all things Commedia. The cast of "The Servant of Two Masters"
University of Portland in Oregon production, directed by Michael O'Neill. Mago Hunt Theatre 2009. Dell'Arte International School of Physical Theatre teaches Mask Performance, Commedia Dell'Arte and Maskmaking as part of its Physical Theatre Studies and MFA program in Northern California. Joan Schirle, Director of Dell'Arte International leads a Study Abroad Program each winter in Bali. This program was co founded by Joan and Newman in 1996 and includes Balinese mask carving with Ida Bagus Oka, Balinese dance with Ni Ayu Artatik, Mask Performance as Ritual and Kecak with Ida Bagus Anom, Shadow Puppetry (Wayang Kulit) with I Wayan Mardika, Voice work with Amsterdam based Jodi Gilbert and East/West comparative mask studies with Joan Schirle.